Two factors – rampant factionalism in the governing People’s Democratic Party and a coherent opposition alliance are changing the calculus in Nigerian politics. For the first time in 14 years, the PDP could lose power at the centre in credible national elections. The PDP has never been a solid structure. Formed as an alliance of convenience by some leading politicians and their patronage networks in 1998, the party nearly broke apart in 2007 and was fractured badly before the 2003 and 2011 elections. However, on each occasion, party bosses corralled the squabbling politicians with a mixture of coercion and co-option – and delivered a victory, boosted by the party’s control of state security and attendant vote-rigging. Successive presidents have used their access to oil export earnings of nearly US$100 billion a year, combined with the threat of highly selective anti-corruption investigations and prosecutions, to reimpose the party’s political dominance (AC Vol 54 No 11, Blocking the great reform bill). Divided opposition parties have also helped the PDP tremendously. Various reincarnations of the historic Lagos-based and Yoruba-dominated left-of-centre parties with their roots in the anti-colonial struggle have vied for control of the south-west, steadily strengthening their grip. Northern-dominated parties have taken a few states in the north-east or the north-west but in total, opposition parties have struggled to win more than a third of the total 36 states. No single opposition party has controlled more than six state governments since 1999. That has changed with the opposition party merger under the flag of the All Progressives’ Congress (APC, AC Vol 54 No 9, Opposition on all fronts). At the same time, President Goodluck Jonathan looks increasingly vulnerable within the PDP, where he faces an all-out rebellion by the powerful state governors, who control local politics and whose cooperation is vital to win a presidential poll. Much of the dissension comes from the President’s undeclared plan to run for re-election in 2015. Jonathan, from the Niger Delta, took office after President Umaru Musa Yar’Adua, a northerner, died in 2010. Since the constitution says an individual can twice be elected president for four-year terms, Jonathan’s allies insist that he is still eligible to run in 2015. Yet that would give him an unprecedented decade in office because he served out President Yar’Adua’s last two years as well. Northern factions in the party already felt cheated out of office after Yar’Adua’s untimely death and pushed hard to have Jonathan stand aside in 2011. Under the PDP’s regional principle, the major offices are supposed to rotate between north and south. However, Jonathan broke this rule in the 2011 election and the prospect of his running for a second term in 2015 has further angered northern leaders. If Jonathan has foes in his own party, his popularity with the general public has also declined. The growing middle class in the main towns and cities combined with the youth vote to help him win the last election. Indeed, he could have won in a straight vote, even without the widespread rigging in PDP strongholds. Since then, frustration has grown about the President’s unwillingness or inability to tackle political and business corruption. The turning point came quickly in January 2012 when his government ended the fuel subsidies, regarded as one of the few mass benefits of oil production (AC Vol 53 No 2, How the fuel row caught fire & Sanusi hits out at subsidy racket). The cut sparked nationwide protests under the banner of Occupy Nigeria. For two weeks, professionals, civil activists, trades unionists, students, musicians and even civil servants held mass protests and brought the country to a standstill. A planned strike by oil workers finally forced Jonathan to reinstate about half of the subsidy. To the protestors, the government had revealed itself as weak and vacillating in the face of organised opposition. Activists also began to pick open the corrupt rackets and their links to political sponsors that were part of the subsidy. It emerged that the arrears on subsidy payments owed to fuel importers in 2011 amounted to $18 bn. or more than half of the federal budget of $28 bn. Given that 2011 was an election year, activists quickly linked the largesse to the country’s biggest fuel importers and party campaign contributions. Initially, the legislators in the National Assembly fared best from the fuel-subsidy crisis. They summoned the leading fuel trading companies to the House of Representatives Ad Hoc Committee on Fuel Subsidy Management to explain who was benefiting from the subsidy system and how (AC Vol 53 No 9, Half-truths on subsidies & Vol 53 No 11, Fuel fraud fans public anger). Then the credibility of the members of parliament nose-dived when it emerged that Committee Chairman Farouk Lawan had been caught in a sting operation, demanding bribes from billionaire fuel importer Femi Otedola (AC Vol 54 No 11, Blocking the great reform bill). Although the fuel-subsidy crisis deeply undermined the government, some resolute optimists still put faith in the credentials of its reform trio: Coordinating Minister of the Economy Ngozi Okonjo- Iweala, Agriculture Minister Akinwumi Adesina and Central Bank of Nigeria (CBN) Governor Sanusi Lamido Aminu Sanusi. Former colleagues at the World Bank (where many had backed her last year to become its president) say that Okonjo-Iweala has pushed through detailed technical reforms in public finance management which will make grand corruption and the diversion of state revenue much more difficult. She complains that these important changes have gone largely unrecognised by the local and international media. Yet sceptics say that even the redoubtable Okonjo-Iweala has made little progress in securing greater accountability over the oil revenue managed by the Department of Petroleum Resources under the aegis of the Minister, Diezani Alison-Madueke, a key ally of Jonathan’s. Although Adesina is widely praised for boosting farm productivity, crop storage and transport, in addition to rationalising seed and fertiliser distribution, there are periodic reports that he will be reshuffled. Adesina and his colleagues see the rapid development of agriculture as the next main economic focus; in terms of Nigeria’s market share, it could outpace oil and gas. There is, too, a wave of new interest in farming from investors, whom Adesina has wooed assiduously on the conference circuit. The term of the much feted CBN Governor Sanusi ends next year and he has made it clear he will not seek a second one. Sanusi is best known for his bold reform of the financial sector and pioneering financial support for agricultural development schemes, his departure could significantly weaken the reformists. The biggest development shaking the political system is the merger of four opposition parties into the APC. In the past four elections, opposition parties joined only ad hoc alliances that had often unravelled by election day. 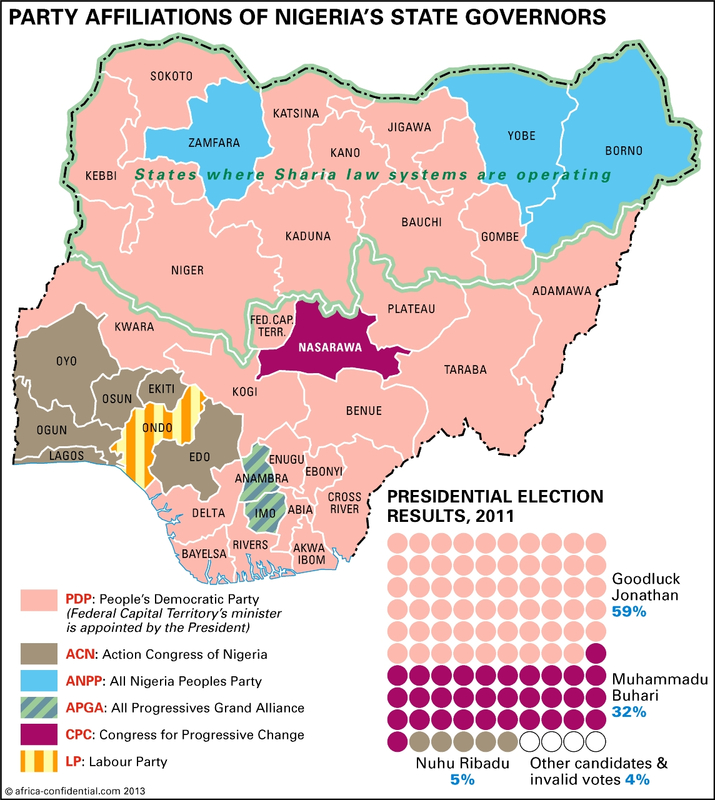 The APC, however, is a credible merger into a single party, formed from the south-west’s Action Congress of Nigeria (ACN); the small northern-based All Nigeria People’s Party (ANPP, AC Vol 44 No 8, North-south divide); the leading party in the south-east, the All Progressives’ Grand Alliance (APGA AC Vol 48 No 8, Too many parties spoil the polls); and Major General Muhammadu Buhari’s Congress for Progressive Change. The APC controls 13 governorships and could seriously challenge the PDP across the country. The key architects of the APC have been Buhari and the ACN leader, former Lagos Governor Bola Ahmed Tinubu. He has rebuilt the old Yoruba political machine after it was reduced to holding only one state in 2003. By 2011, the ACN controlled nearly the entire south-west and one Niger Delta state. Tinubu and Buhari tried to form an alliance in 2011 but the arrangement collapsed over their inability to agree on who would occupy the top of the ticket. This year, however, the two reached a compromise that forms the foundation of the APC. The exact terms of the agreement have not been made public but one aspect is clear: Tinubu has agreed that the presidential candidate will be a northerner and that he will not be the vice-presidential choice. Less clear, however, is Buhari’s future in the APC. He lacks a strong political organisation but he is tremendously popular on the streets of the north – and among some southerners – for his anti-corruption credentials. Buhari is without doubt one of the most popular politicians but big questions arise about his role in an opposition organisation. Under the terms of the APC merger, Buhari appeared to have agreed to stand down in 2015, leaving himself and Tinubu as kingmakers. Now, Buhari says he plans to run again. He might again withdraw. At the same time, members of the Tinubu camp say that they could work with Buhari as their candidate if they could play the leading role in developing the new opposition coalition. In any event, they may have to. Buhari has name recognition and grassroots popularity but he has no viable political organisation, even in the north. The APC’s prospects for 2015 also depend upon whether or not a significant number of the northern PDP governors can be convinced to cross the floor. The current tally suggests that six to nine PDP governors, most but not all in the north, are considering decamping to the APC. The Jonathan-controlled PDP leadership has suspended the party’s governor in Sokoto and is threatening others. Open warfare has broken out between Jonathan’s camp and Rotimi Chibuike Amaechi, the PDP Governor of Rivers State, over control of the the Nigeria Governors’ Forum. Amaechi has faced down Jonathan’s efforts to oust him as Chairman and has won strong backing from all the opposition governors and several from Jonathan’s party. An articulate and lively advocate of political change, Amaechi is due to address London’s Royal Institute of International Affairs this month. By contrast, Buhari cuts a more sombre figure. He also frightens most of the political establishment, particularly those involved in corruption. Previously, he has talked of the need to gaol many from the political class as a way of cleansing the system. Uncharacteristically, he has made quiet overtures in recent months, suggesting that he might be willing to overlook past corruption if it stops when he takes office. Indeed, Buhari’s alliance with Tinubu and his patronage machine suggests that he is open to more pragmatic tactics. Many leaders – even retired military officers such as Ibrahim Babangida and Aliyu Mohammed Gusau – who have crossed Buhari, worry that they would still remain targets.A mass exodus to the APC is unlikely right away, perhaps not until mid-2014. The northern governors will continue to undermine Jonathan within the PDP at first, working with former President Obasanjo and other disaffected members to win control of its machinery. Their chances of success are slight, given the massive resource advantage of the presidency and their fears of an APC led by Buhari. The northern PDP governors are now discussing a ‘third way’ option of forming their own party. Former Vice-President Atiku Abubakar and other senior politicians have entertained similar notions. Such developments would be a major blow to the PDP but would also present the APC with some difficult choices. For now, it looks the least likely route for the northern governors, if only because it would require a solidarity among them that they have yet to demonstrate. The APC’s fortunes depend above all on its presidential candidate. Although Buhari dominates discussion at the moment, other strong candidates are quietly testing the waters, some of whom have reformist credentials. If the APC can produce a presidential flagbearer who is sufficiently credible to attract both elite and wider electoral attention, as well as encapsulating the frustrations of the north, the party could gain a good number of PDP governors and supporters as well as tap into the vast well of public exhaustion with corrupt PDP rule. If the APC is able to construct a sufficiently national organisation to challenge the PDP in most of the 36 states, two additional factors will work in the opposition’s favour. Firstly, the large coalition of civil society groups that came together under Occupy Nigeria remains fairly organised and could throw its weight behind the opposition. That would help election monitoring and street protests if the 2015 elections are close. Trades union leaders, however, have long relationships with the PDP that will make their role uncertain. Secondly, the Independent National Election Commission is headed by a reformer, Professor Attahiru Jega, who has been battling to break the grip of the politicians on the election system (AC Vol 51 No 16, Father Kukah, Professor Jega and the vote). Unfortunately, the INEC is structured so that that he does not control its state or local offices, so that the local political machines were able to alter many results in 2011 after the results left the polling stations and before they reached the federal level. Jega is considering several ways to get the actual polling station results directly to the INEC leadership and to the public, but he faces strong resistance from political networks. APC leaders express private doubts about whether Jega is really independent. Nevertheless, his efforts at INEC, combined with civil society support, could provide the required ingredients for an APC victory if the party gains backing from the northern governors to give it the national organisation it needs. Yet the hurdles are high. First and foremost stands the remarkable ability of the PDP to reinstall a modicum of party discipline, typically fuelled by the deep pockets of the presidency. Jonathan still has time to reach out to northern leaders and negotiate a new deal with enough governors, although that could be difficult. PDP organisers could take advantage of the heavy military presence in the north-east to interfere with election outcomes there. More promising for the President is the tenuous thread upon which the APC merger hangs – the agreement between Tinubu and Buhari. Their alliance fell apart in 2011 and could well fray again as difficult choices over candidates and policy direction will have to be made. Tinubu has also shown a willingness to work with the PDP in the past, so he may be amenable to PDP overtures – or simply stay at home for the presidential election – if Buhari proves too difficult. All this focussing on the presidential election, however, obscures other issues for the APC and its countrywide reach. The opposition now has enough organisations in many of the states to contemplate a more comprehensive strategy. If it does not employ all its energy on winning the presidency, the APC could prepare a Plan B in case Jonathan outmanoeuvres it in 2015. It might add more state governorships and reach 18 or 19 states. That would give it a powerful base from which to take the presidency in 2019. Such advance planning would be untypical of senior politicians but if they can stitch together a viable opposition, they will need a far more strategic approach from now on. Prepared for Free Article on 23/04/2019 at 13:04. Authorized users may download, save, and print articles for their own use, but may not further disseminate these articles in their electronic form without express written permission from Africa Confidential / Asempa Limited. Contact subscriptions@africa-confidential.com.